Papua New Guinea international footballer Nigel Dabinyaba is poised to make his professional debut in the Malaysian Super League this weekend as his new club FA Penang this weekend. After opening their campaign with three losses, Penang will hope the mercurial Dabinyaba can turn their fortunes in their clash with Sarawak this weekend. Dabinyaba picked up an injury in the clubs final pre-season match and consequently missed the first three matches of the new season. The 24-year-old is set to become the first Papua New Guinean to play at the professional level since Manis Lamond graced the Australian National Soccer League in the 1980s and 1990s. Dabinyaba has been handed the club’s number 10 shirt, an honour normally bestowed on South American players in a foreign league and the significance is not lost on the 9 cap international. “I know it’s going to be tough because I am now playing at a professional level, but I want to stay positive every day and improve on and off the pitch. “I want to be a good ambassador my country so the other clubs in Malaysia will consider bringing players from Papua New Guinea in the future,” said Dabinyaba. Dabinyaba’s meteoric rise to a professional football is one characterised by hard work and discipline. From humble beginnings spent mostly in Lae, together with some time spent in his mother’s village in East New Britain, Dabinyaba now finds himself in Penang, a province of just under 2,000,000 people. A short stint late last year in Brisbane, Australia and Christchurch, New Zealand was the first time Dabinyaba had lived outside of Papua New Guinea, although his mentor believes the change of environment will not be too much of a factor for the softly spoken front man. “As a person Nigel is mentally tough, dedicated, and driven to succeed,” says Papua New Guinea men’s national team assistant coach Reginald Davani. A very religious person, the 24-year-old retains good off field habits, including avoiding alcohol and managing his diet. Sacrifices that Davani knows will make the difference in the harsh environment of professional football. Davani himself is no stranger to the characteristics necessary to succeed outside of Papua New Guinea, carving a 15-year semi-professional career that took him as far afield as Australia, New Zealand, Solomon Islands, the United Kingdom and Vietnam. “I wanted to push him because of the type of person he is; dedicated to his craft, down to earth and willing to sacrifice to ensure that success,” said Davani who has been instrumental in Dabinyaba’s journey to Malaysia. Davani is passionate about pushing his countrymen to achieve on the football field and takes a hands on approach as a mentor and advisor. “I hope that Nigel is the first of many Papua New Guineans to follow this path, and maybe this is a stepping stone to bigger leagues in Asia and maybe even further afield. “I’d like to thank PNGFA also for assisting with the administration work for Nigel’s time in both Australia and New Zealand. The short stints in those countries has given him the grounding before making that step up to the professional scene,” said Davani. Although Penang only narrowly avoided relegation from the Malaysian Super League last season the club earned global recognition as earlier this year when Mohammad Faiz Subri became the first Asian to win the FIFA Puskás Award for Goal of the Year. Subri was awarded the honour for his physics-defying free kick that clinched a goal during the Malaysian Super League match against Pahang at the City Stadium last season. 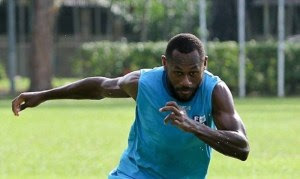 FA Penang will face Sarawak on Saturday, 11 February with Dabinyaba set to fulfill a long-standing personal ambition.